This summer, as part of the computer equipment lease replacement process, we will start to deploy VDI (virtual desktop infrastructure) thin clients. Over 150 thin clients will replace desktops in the Walsh and Quinn libraries. In classrooms at Rose Hill and Lincoln Center, ITAC’s Teaching and Learning team will replace over 80 podium PCs. Several departments are also scheduled for thin client deployments before the end of the summer. Look for more updates on thin client deployments in our future email updates. A thin client is a desktop terminal with no hard drive. All features typically found on a desktop PC, including applications, data, files, memory, and so on are accessible, but they are stored on our servers. Check one out! We have thin clients for you try at Lincoln Center in room 309 or visit the lobby of Dealy Hall at Rose Hill. All University software installed on a standard desktop has been virtualized and is available on a thin client desktop. Virtual Desktop Infrastructure (VDI) allows users to log into their personal Windows desktop and use their applications virtually, from almost any device, including Windows and Mac desktops, laptops, and tablets. No matter what device you use or where you are, your virtual desktop and files are available and look the same. The only requirement is a device with Internet access and the ability to run our application (called Citrix). A thin client runs your virtual desktop. It is a small, light hardware unit—about the size of a book—connected to your monitor and keyboard. It works like a traditional computer, but stores your data on a server. Advantages to using thin clients include a longer lifespan than a typical desktop computer’s. Thin clients don’t have hard drives, so they only need replacing every seven years or so. It takes just a few minutes to replace a thin client and download your files from the VDI server. Thin clients also consume less energy. You don’t need a thin client to access your files. Session Only uses your chosen device, such as a laptop at home, to log into your virtual desktop to run your Windows programs from anywhere, even on a Mac. Session Only is ideal for users who are constantly on the go and need to access their files and applications from home or elsewhere. If you already own a computer, such as a laptop, and would like to eliminate the need for a workstation, Session Only is best to use. Whether you’re using a thin client or Session Only, both versions benefit those who require flexibility in accessing their files and applications from more than one place. Because thin clients are so small, they help your office conserve space and resources. In offices where workstations are shared by staff, a thin client eliminates the need to assign a computer to each person. Instead, staff can share workstations and access their personal virtual desktops by logging into VDI. Like VDI, VPN gives users online access to Fordham resources. But VPN does not provide access to your personal desktop, applications, and files. Only VDI can do that. Your virtual desktop automatically includes applications deployed on all University desktops. You cannot install additional applications yourself, but you can ask Fordham IT to install them. To make a request, submit a virtualization request via the Service Request section in the Tech Help tab. Some applications may not be available for virtualization, though most are or will be. All VDI thin clients use central network storage, and your files are backed up there automatically, every night. If you use P:/ and S:/ drives, your files will automatically back up to them, as well. Should you lose your files in these locations for any reason, Fordham IT can assist with their restoration. In addition, you can back up your files to Google Drive or other cloud solution, or use an external storage drive (such as a hard drive or thumb drive) with a USB connection. VDI runs an autosave every 10 minutes. If you accidentally close your virtual desktop, you should be able to restore the documents you were working on. When you log into VDI, the desktop window may minimize to accommodate the screen size of the current device in use. If the window on your screen looks too small or too large, it is probably due to your device’s resolution. To resolve, go to your device’s settings to adjust the window size for the current device. Contact IT Customer Care (see below) if you need help. One of VDI’s great features is that you never have to perform your own application upgrades. Fordham IT keeps your applications upgraded with the latest versions and patches. Fordham IT also performs regular maintenance on our VDI servers and applications to ensure they’re running at optimum condition and meet our security standards. This may involve some system downtime, but we do our best to schedule maintenance during off-peak hours and communicate the maintenance schedule with all VDI users to help everyone plan ahead. 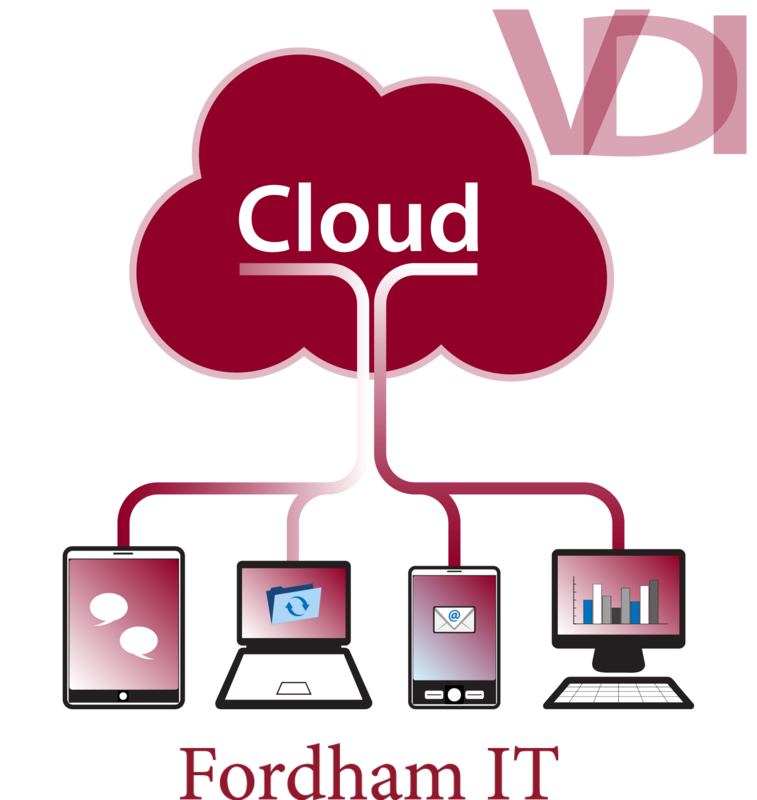 For additional information or to request a virtual desktop, contact the VDI Team at vditeam@fordham.edu. A team member will contact you to discuss your requirements. For help VDI, contact IT Customer Care via the Tech Help tab at My.Fordham.edu, or helpit@fordham.edu or 718-817-3999. Fordham IT’s committed staff of talented men and women deliver high quality technology support and resources for teaching, learning, research, and campus life. We also support the technology that enables university staff to do their jobs effectively.